New Delhi, Mar 27 : The Centre today notified new rules for the management of bio-medical wastes in the country that prescribe more stringent standards for incinerators to reduce emissions and envisage the creation of a bar-code system for bags containing such refuse. The Environment Ministry’s Bio-medical Waste Management Rules, 2016, also bring vaccination, blood donation and surgical camps under its ambit while providing for pre- treatment of laboratory and microbiological waste and blood samples and bags on-site as prescribed by the World Health Organisation and National Aids Control Organisation (NACO). Under the new rules, bio-medical waste has been classified into four categories instead of the earlier 10 to improve the segregation of waste at source. Also, the procedure for getting authorisation has been simplified. “The new bio-medical waste management rules will change the way the country used to manage this waste earlier. Under the new regime, the coverage will increase. It also provides for pre-treatment of lab waste, blood samples, etc. “It mandates bar code system for proper control and has simplified categorisation and authorisation. Thus it will make a big difference to the Clean India Mission,” Environment Minister Prakash Javadekar said while releasing the new rules. Bio-medical waste comprises human and animal anatomical waste, treatment apparatus like needles, syringes and other materials used at healthcare facilities. This waste is generated during diagnosis, treatment or immunisation at hospitals, nursing homes, pathological laboratories, blood bank, etc. 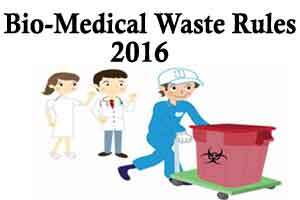 Total bio-medical waste generation in the country is 484 tonnes per day (TPD) from 1,68,869 healthcare facilities (HCF). Of this, 447 TPD is treated, ministry officials said. Under the new rules, use of chlorinated plastic bags, gloves and blood bags will be phased out within two years while training will be provided to all healthcare workers, who will also be immunised regularly. A ministry statement said that under the new rules, bedded hospitals will get automatic authorisation while there would be a one-time authorisation for non-bedded hospitals. Under the new rules, the state government concerned will provide land for the setting up of common bio-medical waste treatment and disposal facilities.